Sony's basketball game does everything you could possibly wish for...except when it comes to actually playing basketball. Poor, poor Sony. All the company wants to do is keep up in the basketball game market. They tried valiantly last year to get back into the limelight with NBA 07, but the game just couldn't keep up with the far superior NBA 2K7 on consoles. (To its credit, it almost broke even with NBA Live, though.) This year turns out to be an even worse horse race, due to the fact that NBA 2K8 and NBA Live 08 are both superior titles this time around, leaving NBA 08 in the dust. 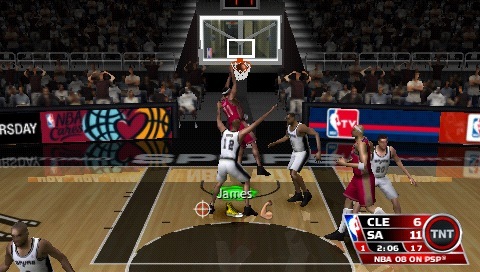 The game supposedly has an advantage on the PSP when it comes to its mini-games and Conquest Mode, but we're here to tell you, folks -- NBA 08 doesn't just shoot itself in the foot. It takes out its ankle and toes as well. The big problem here is that the gameplay isn't very fun. Offensively, you have the ability to shoot with the assistance of a color-based meter around the mall. Green means you're good to go for the basket. Red means you don't have a chance in hell at making it. Tan-ish means that maybe, just maybe, you'll get lucky -- but probably not. Get used to seeing red a lot because the shooting meter is somewhat broken. The timing's a little off, resulting in your firing off bricks more often than you'd like. The AI, however, has no problem pulling off incredible shots -- even ones that make each player look like Kobe Bryant. Get used to seeing dominant AI all over the court, too. It's tweaked to the point of near impossibility. You can't get off clean three pointers because there's a defensiveman jumping in your face, successfully intercepting the ball each and every time. As for defense, yeah, right. The AI cleans house nearly every time, with successive shots made and a win streak that almost resembles the old school Chicago Bulls. The game plays okay otherwise, but there's not enough change-ups to the formula to consider it a fresh start. Plus that means having to put up with the dreaded, bungled computer intelligence. Presentation-wise, the game's decent. The visuals run at a sharp sixty frames per second with nary a hint of graphical loss or slowdown. The sound's not too shabby either. Ian Eagle and Mark Jackson make a terrific play-by-play team, calling it just like they see it. The sound effects and arena music is themed just right. So the game looks and sounds just fine. It's the rest of the balance that SCEA needs to work on. There's a lot of content here as well. Along with the routine season and online modes (you can take on people either through AdHoc or Infrastructure), there's a variety of mini-games to choose from. Pinball's a nice touch, with various tables available to play; Own the Court is a well-timed shooting event; Elimination has its moments; the whac-a-mole-like game has great addictiveness; skee-ball's not bad (despite some screwed up mechanics), dodge ball's okay and the Breakout clone is a nice throw-back to the old-school. On top of all this, the Conquest mode has some promise. You go around the nation and dominate basketball legions collectively. It's almost like Risk, but with Pacers in the place of your soldiers. Well, okay, maybe that wasn't the greatest description. Still, we can't fully recommend a basketball game if the main function of the game is this broken. 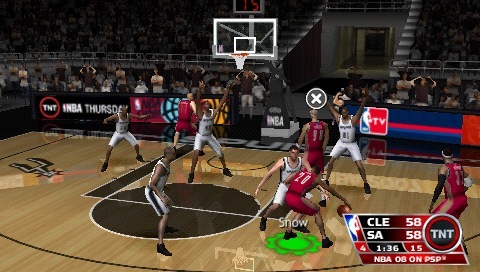 NBA 08 has potential galore, but it's blown by the lack of basic principles. If you can't shoot worth a damn or defend worth a damn, then, really, what's the point if the AI is just going to run right over you? If you like incredible challenges or just can't live without trying a basketball-ified version of whac-a-mole and pinball, by all means step up. Just remember to keep in mind what you're getting into. What's Hot: Fun mini-games; dominant Conquest mode; decent graphics. What's Not: AI is too dominating on court, both offensively and defensively; the basketball game in itself isn't that much fun as a result.